Hi friends! 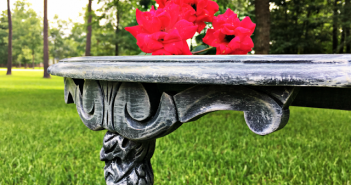 Happy almost the end of May – can you believe it? This year is flying by so fast! I have a treat for you today – it’s Themed Furniture Makeover day where my furniture loving friends and I share our latest makeovers. This month’s theme is Red, White, or Blue. It all started when came across this coffee table at a local garage sale. 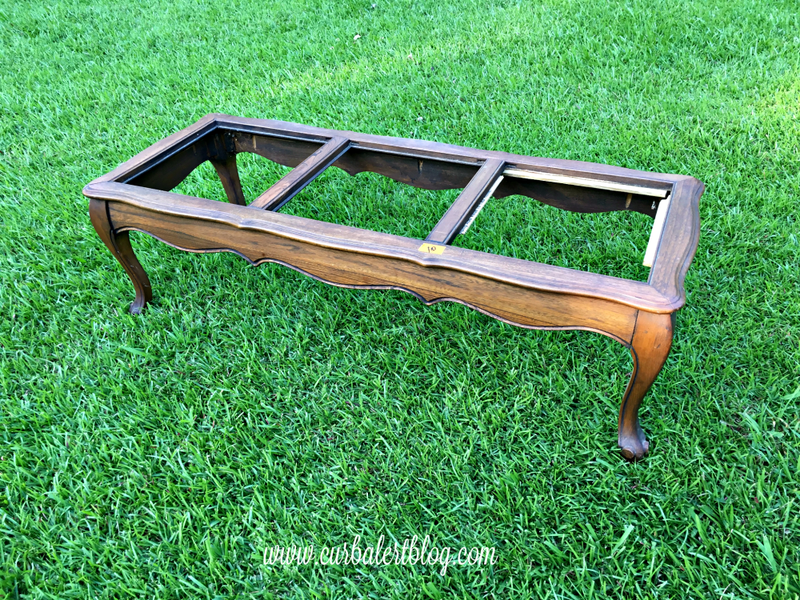 I have been searching for the perfect coffee table for y e a r s (yes years) and this one fit the bill. It was in perfect condition, sans the glass, and I was super excited that the owner was marking the price down from $20 to $10. Cannot beat that! I painted it with Waverly Chalk Acrylic paint in white. This picture shows it with just one coat. 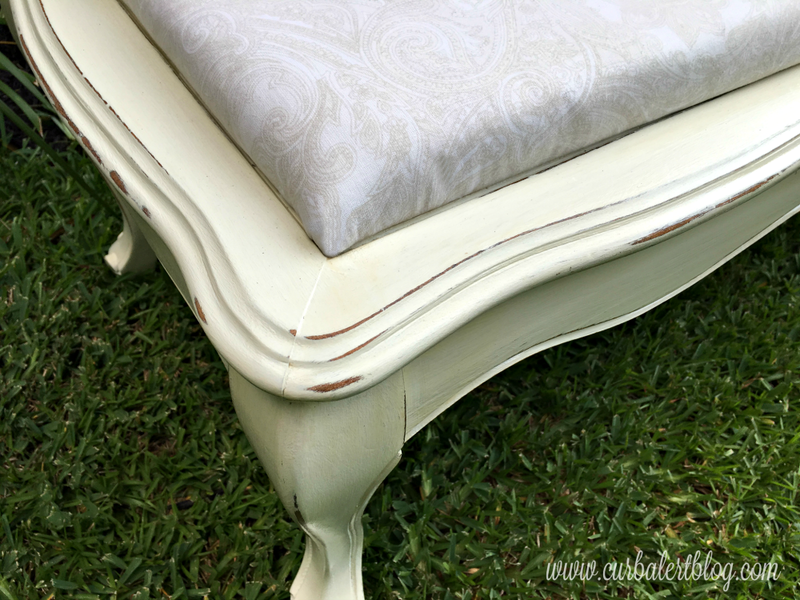 I then lightly distressed it on the edges and sealed it with clear Polycrylic Satin. Note: sometimes the poly will yellow the white paint a bit but I actually wanted it that way for this table as I wanted it to look a bit more “aged”. Now on to the ottoman top. 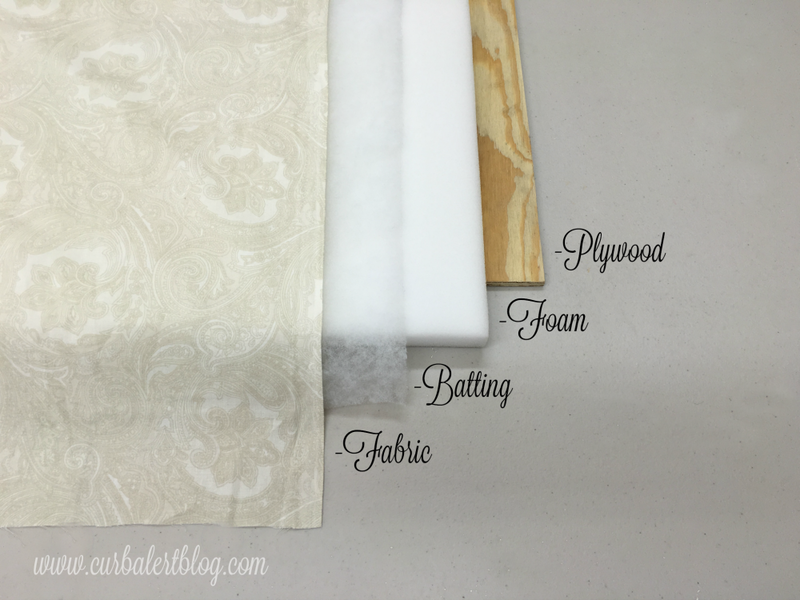 I layered the materials as shown and then used spray glue adhesive to lightly bond the items together. 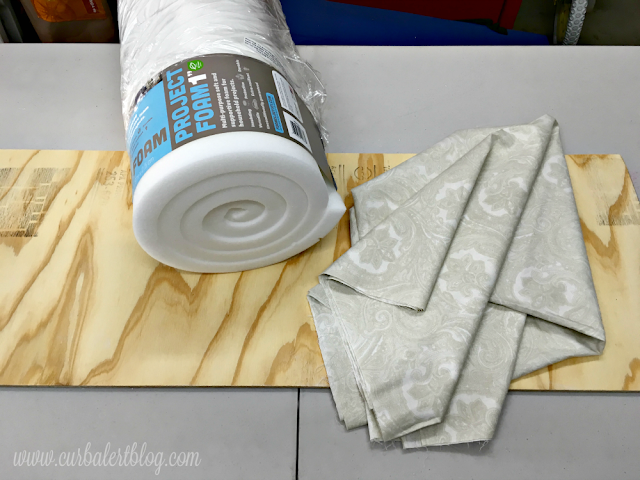 I wrapped the plywood with fabric and stapled it to the back with a staple gun. I then screwed the entire seating onto the coffee table from the underside, making it into the perfect ottoman seating. 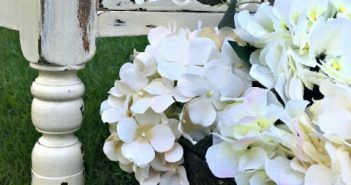 I love the creamy antique white. I did Not love the fabric (although I do think it’s pretty). It just seemed bla to me once I saw the final product and it was so thin that it showed every crease and bump. I then found a creamy thicker upholstery fabric. It doesn’t have as much detail to it but it’s soft and now will go well with my overall vision for it in my space: my Master Bedroom. Excuse the various color tones, it is very difficult to photograph anywhere in my house in this room. 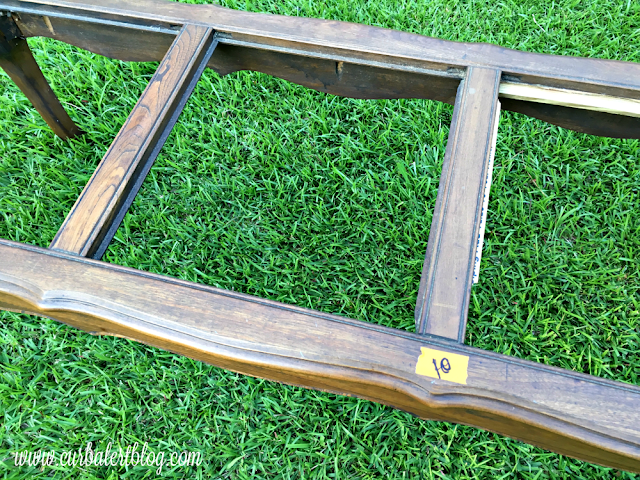 Hence the reason why I usually photograph my furniture makeovers outside. 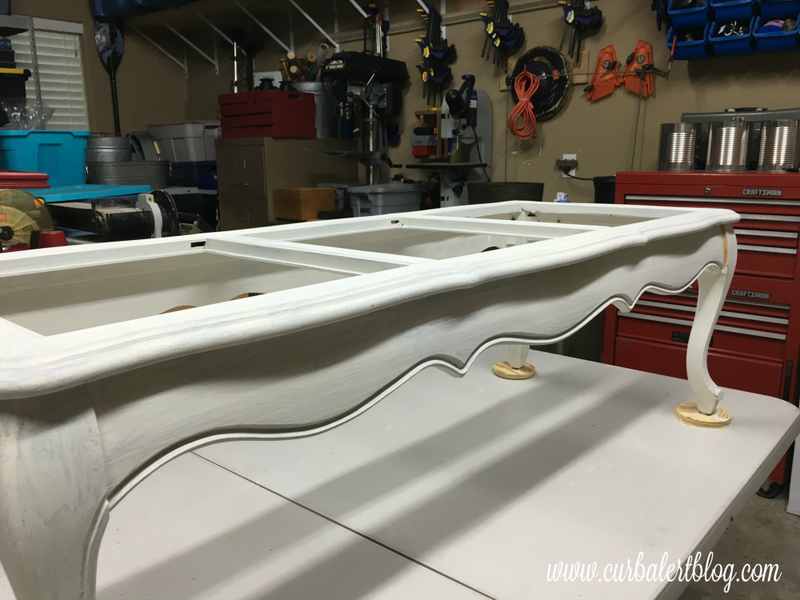 …and even goes well with my DIY Headboard Bench. 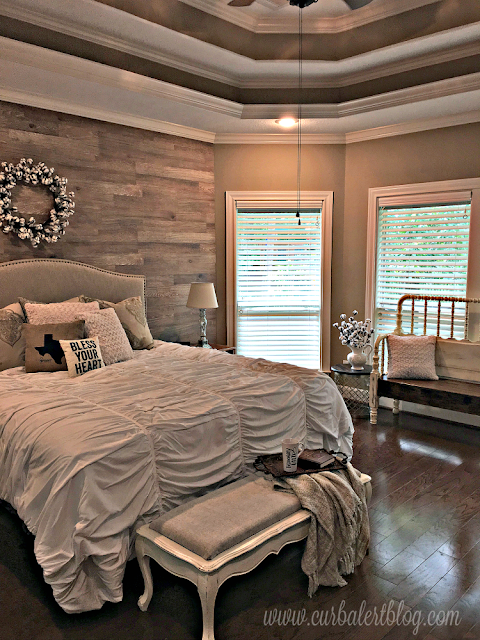 I love the look of it with my DIY planked wall. 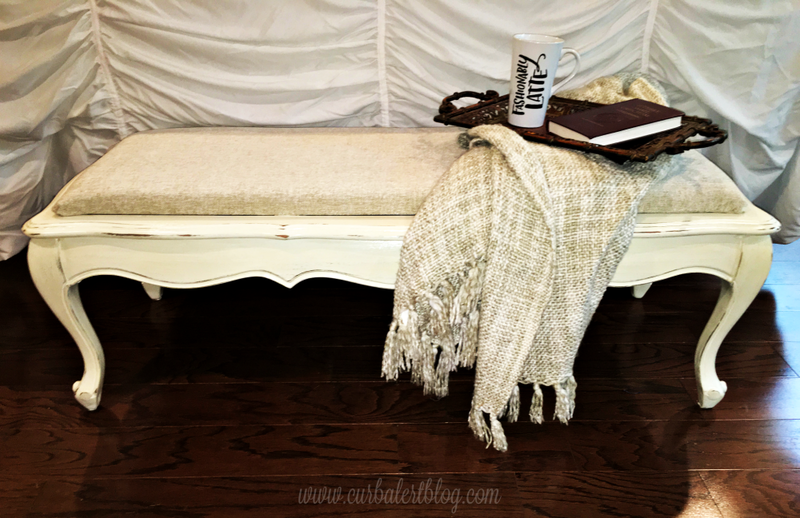 The room is finally coming together and I think the Repurposed Coffee Table Ottoman fits right in perfectly! Now on to check out my other Themed Furniture Makeover friends. Be sure and stop by their blogs to see their amazing makeovers, they are all so creative! 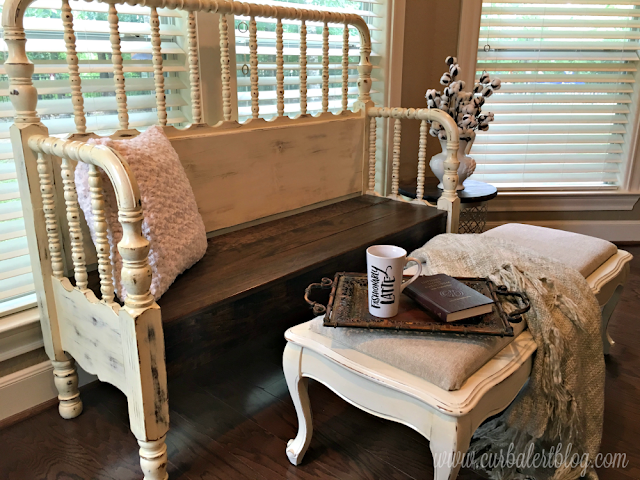 Not only is your coffee table turned bench to die for, but your bedroom…it's AMAAAZING! You go girl! This is such a great amakeover. I love what you did with it. IT could be used in so many places! 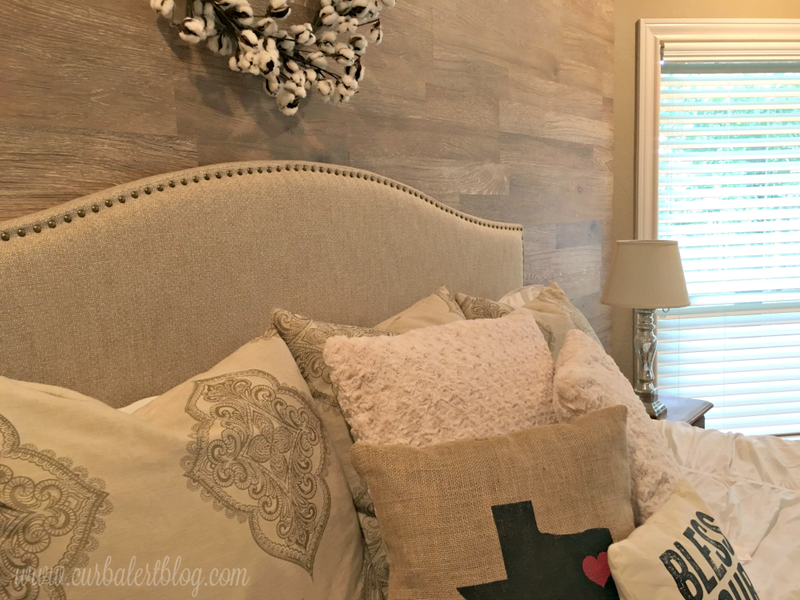 Gorgeous makeover for a gorgeous room! Well done! 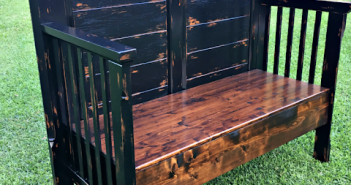 Awesome bench transformation! ♥♥♥ your bedroom, it is so serene. Beautiful transformation, Tami! 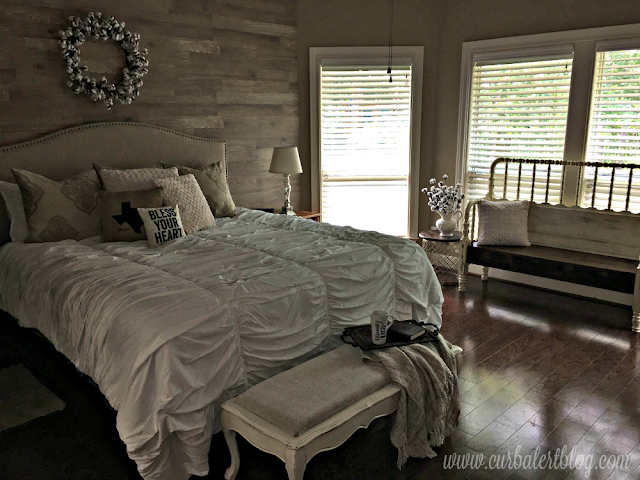 I am swooning over your gorgeous bedroom. 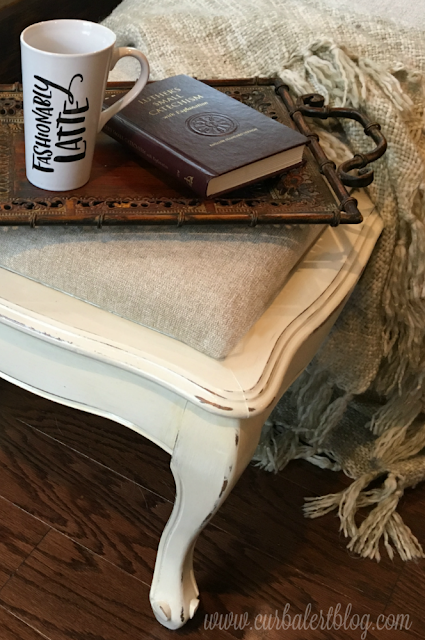 The ottoman looks perfect in the space – good call on the second choice of fabric. I just LOVE your repurposed ottoman – and your room is insanely gorgeous!! Wow!! 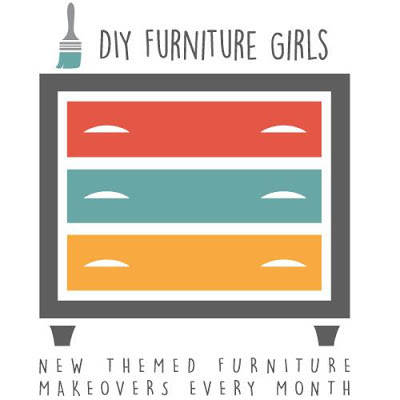 Your bedroom is so pretty and your DIY ottoman looks fabulous in it. I really like how you used a coffee table to make an ottoman and I need to remember how you did it. Awesome job!! Hey Tami, you have a wonderful ottoman! This loves lovely in the bedroom. Love the makeover! That is awesome! 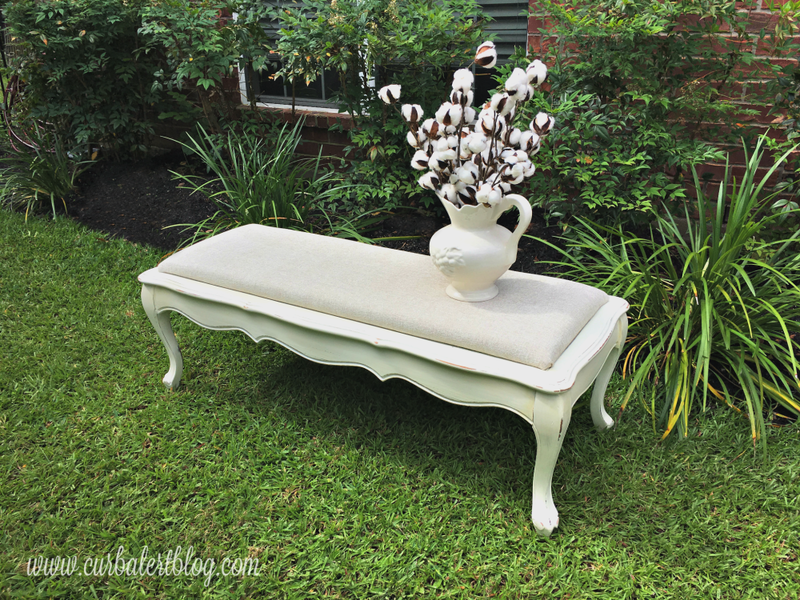 I love this idea and what you did to change it from a coffee table to a bench. Love it! Your bedroom is beautiful. Tami, that is seriously gorgeous! It is totally perfection as a bench, and it looks absolutely stunning at the end of the bed! This is gorgeous! 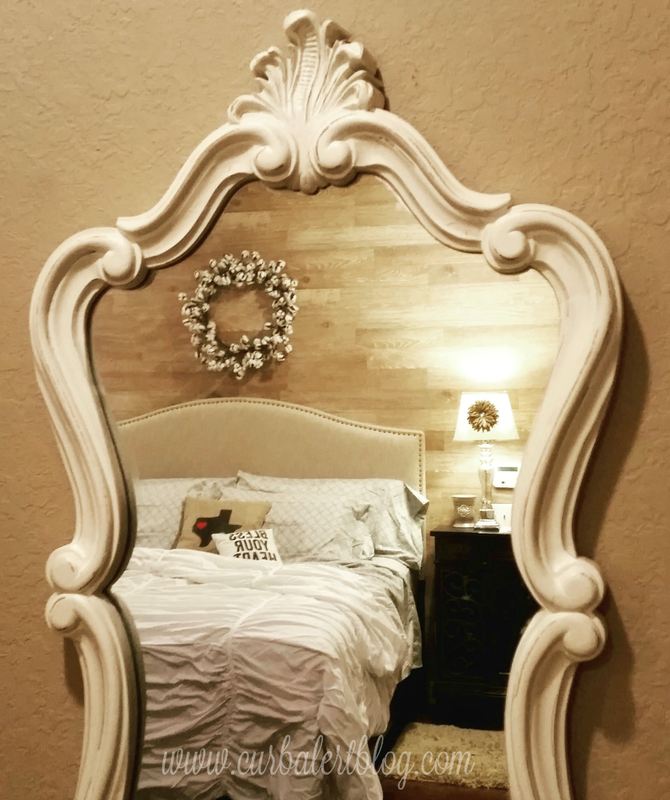 It looks perfect in your bedroom which is absolutely stunning! Wow, this is perfect for your gorgeous bedroom! Love! Tami, you are so talented! 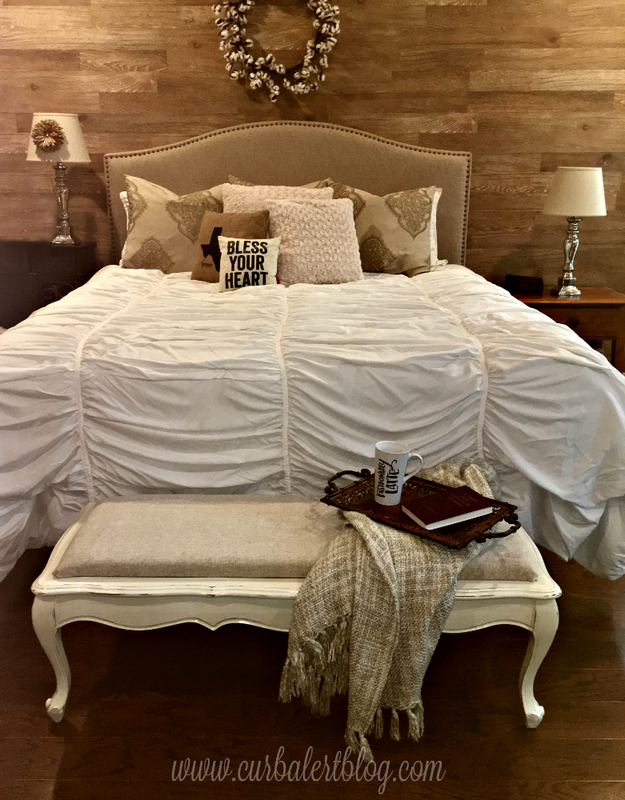 Your coffee table ottoman is awesome; and it looks amazing in your gorgeous bedroom! It's perfect! Hi Tami, I love your master bedroom! What paint color is on the walls?